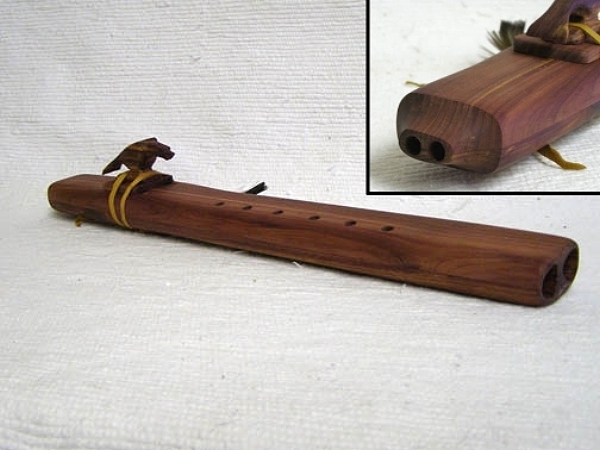 This is CEDAR DRONE FLUTE which is hand made by well known Navajo flute maker, Jonah Thompson. 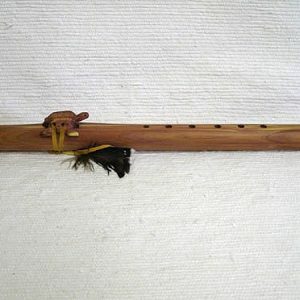 A drone flute is actually 2 flutes together in the same instrument. This style alows theplayer to play chords. These cedar flutes are tuned to A minor. These flutes measure 21″ in length. Native American flutes are instruments of music, ceremony, entertainment, courtship and love. Some Navajo medicine men say a girl will find irresistible the boy who plays the flute for her. Most traditional Navajo flutes were made of sunflower stalk, but today the flues are evolving into a medium of artistic expression that uses a variety of materials. 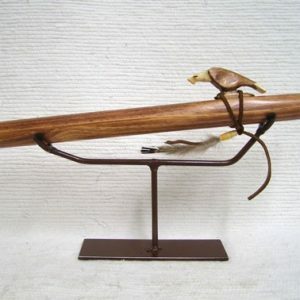 Select your favorite totem for your personal flute. Choose from bear, buffalo, eagle, mountain lion, pony, turtle or wolf. Please make your selection in the drop down menu before adding the item to your cart.